Do you remember those side-scroller games where you have to obliterate pretty much anything in your path whilst avoiding obstacles in order to get a high score that would rank you king of the arcades? Well if you were to take the format of Gradius for example and combine it with the mechanics of Flappy bird with a Castlevania makeover and a bit of Ghouls N Ghosts thrown in because ‘Why Not? !’ you will most likely end up with Knight Terrors. Knight Terrors is created by Freakzone Games & Nicalis Inc, The latter being the masterminds that brought Binding Of Isaac: Afterbirth, Cave Story and 1001 Spikes to larger audiences. Well, the American Video game Development & Publishing company have built themselves quite a reputation in helping other developers get their games out there with funding, publishing or even lending a hand in its development. Most of their games have sold over a million copies which is not bad at all for a third party developer that is not in the big leagues like EA, Bethesda or Ubisoft. So what is Knight Terrors all about? Well, you play a possessed suit of armour known only as “The Knight” that wields a mighty sword and can fly with blood red wings. You must run and fly over the countryside and kill all manner of terrible monsters that you find in your way which should you let them pass you three times or should you get hit three times, its game over. It sounds simple enough and the plot is pretty simple, jump over obstacles, slay all the monsters and collect power-ups to ensure you can get a great high score. There are zombies, bats, flaming skulls, ghosts and even UFO’s that make the odd appearance and it is up to you to vanquish every single one you come across. Set in 16-bit Graphics, the game holds up pretty well and I think it works well in its favour as it feels like an arcade game from the 80’s. The chip tune soundtrack has that typical horror theme to it and just adds to the aesthetic. The colour scheme of the enemies stand out well on the black background and the sizes of the sprites are nicely visible on the screen both in handheld mode and in docked mode and gives you just enough time to see the upcoming enemy or obstacle and react to it. Knight Terrors is an endless runner so you keep going until you fail or die and you are automatically propelled through the level which means if you miss an enemy, there is no backtracking. You also have only two control buttons, ‘L’ or ‘Y’ to jump and ‘R’ or ‘A’ to use your weapon. I find it more comfortable to use L for jumping and A for attacking purely for the layout of the Joy-cons in Handheld mode, though there may be some folks that prefer working both buttons with a single hand. Alternating between when to jump and when to swing at an enemy is a lot more difficult when everything on the screen is generated at random. So, when you sometimes get two enemies at the same time and an obstacle to jump between, you are left with only half a second to take them out and take a hit or let one by and kill the other whilst avoiding the moving spikes. Who would have thought that a game so simple in design would be so strategic? You start the game with a single mode, Normal, but you can unlock up to four other modes by completing certain tasks, like reach level 6 on Normal, Score 50,000 points on Flight Knight, etc. As the levels are randomly generated, no level is the same twice, so you could have a perfect run and score 100,000 points in one sitting but struggle to string 30,000 in the next ten playthroughs. This roguelike element adds to the game’s replayability as you find yourself constantly adapting to your situation and never really know what is going to be thrown at you. Each mode that you unlock has its own gimmick within the game. Flight Knight has you constantly tapping the jump button to stay in the air as the ground is now full of spikes. Endless Knight has you constantly running until you miss three enemies or you die, this differs from the Normal mode because it is only a single run instead of a series of ‘levels’ or stages which resets the miss counter. There other two modes we will let you find out for yourself as not to spoil the game too much. Each enemy has its own pattern as well, Zombies run across the floor, bats flight straight in the air, Flaming skulls bob up and down and ghosts appear out of nowhere on the central line of the screen. This alone can keep you entertained as you try to string a combo together, which increases by 100 every time. Getting hit or letting an enemy pass you can reset your score which means you have to chain your combo up again if you want to get a better high score. There are power-ups including the axe, boomerang, extra health and more which, when using the attack but can arc Axes across the screen or throw the boomerang in a straight line or swing a mace around your character which will keep working until you are hit. Hearts on the other hand, can replenish your life by one or give you another heart to your health meter. Power-ups are unlocked by reaching certain scores over any game mode. 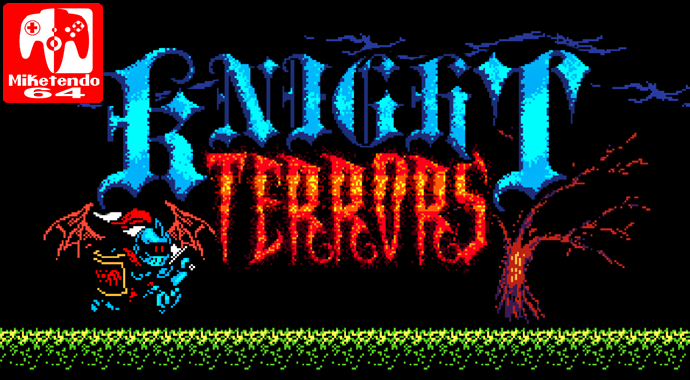 For a game inspired by 16-bit graphics and 80’s style difficulty, Knight Terror holds up on its own okay. It is another simple enough game but it will take great talent to truly master and adapt to its ever-changing level generation and enemy spawning. One drawback though is that it has only one level theme. It would have been nice if there was an option of different locations like inside a castle, in the graveyard or if not the option to choose, at least randomly change the scene of each stage to make each stage truly different. Then again, at only $2.99 it is not going to be a waste of money and is a fun game to come back to over and over when you feel that need to beat your score again. At the end, Knight Terrors is not a very long game but it can be quite a time sink. You could hope to play it for an hour and before you know it, you have forgotten to do your homework or you have left the kids at soccer practice or realise you have left your bride to be waiting at the Altar (okay, maybe not that extreme). It is surprising how much time flies by when playing games like these. It is worth sticking in your trick or treat bag for Halloween or at the very least, on your Nintendo Switch.